The bang trick is great fun to watch and perform. A dog that is taught properly to respond to “Bang” as a command word will drop to the ground, when shot with a gun created from his handlers fingers, and stay perfectly still until a release cue is given. This trick is very impressive when your dog can do it well. The skill used in how to teach a dog to play dead is mainly timing and reinforcement. It is a brilliant trick to teach with a clicker for this reason alone. We are however going to utilize a cue word rather than the clicker to teach this trick. By reinforcing with a word you will learn a lot about your own timing when giving commands to your dog. Whilst showing you how to teach a dog to play dead we will use the cue word “good” and offer a treat as a follow up action. Your dog will quickly associate the word with his reward. The cue should be given at exactly the time your dog is carrying out the behavior that you would like to encourage. Modern, kind and motivational is a fantastic description of positive dog training. During the process of how to teach a dog to play dead, you too can learn. There are certain personal rules that professional dog trainers follow in every training session. Whilst teaching your dog this trick, we will be following two of these rules. Positive reinforcement is the act of reinforcement with reward, of a behavior offered by your dog. Because a dog can offer more than one behavior at once, it can be easy to reinforce the wrong one. An example is a dog that sits and barks can easily associate a reward for either the sit or the bark. As the one teaching your dog, it is your responsibility to time the reinforcement to pinpoint exactly the behavior you want. Admittedly this timing is not as easy as it sounds. We will be using only two words when teaching your dog this trick. These words are “good” and “bang”. One of the biggest dog training mistakes is to talk too much. If you are talking throughout the training session your voice will begin to have no effect. It will simply sound to your dog, like a radio in the background. So challenge yourself to only say these two words whilst teaching your dog this trick. If this behavior is not pre learned simply wait. Your dog will lie down eventually then use the word “good” and give him a treat. Now he knows that the down position is beneficial begin to withhold the word “good” and allow him to work out what to do next. He will quickly attempt to get nearer to the floor. Every time he offers a behavior that seems to lead to him lying on his side reinforce with “good” and give him a reward. Keep this up and he will soon learn that lying on his side provokes the word and reward. Now gradually introduce the word “bang” and the “finger gun” Use it as a prelude to “good” and his reward, you are associating the word to his lying down position. Progress by withholding the two words and reward ever so slightly until your dog lies completely still on his side. Then further the progression by bringing the word “bang” and the “finger gun” forward so that you offer it as your dog begins to lie down. Keep the word “good” and reward for prolonging the position. Depending on your individual dog this could take two to ten short sessions, every canine learns to a different timescale. 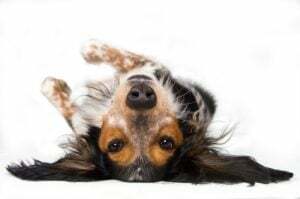 If you pay attention to your timing, you will be able to see whether your dog has interpreted your reinforcement command, whilst you learn how to teach a dog to play dead, like a professional.